Where Roots And Wings Entwine: Chill Factor Drink Bottle - review. 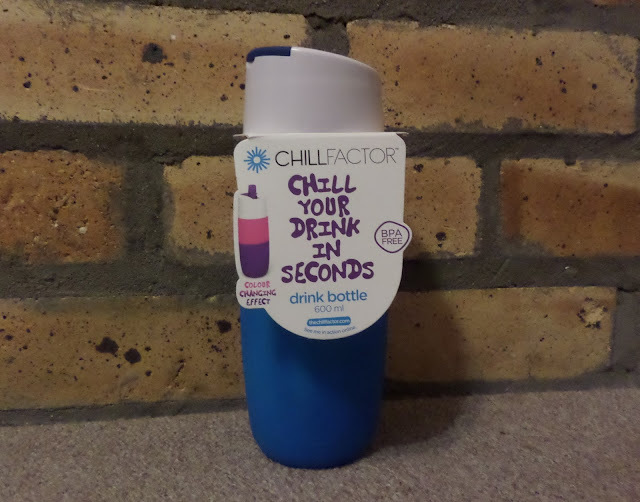 Chill Factor Drink Bottle - review. 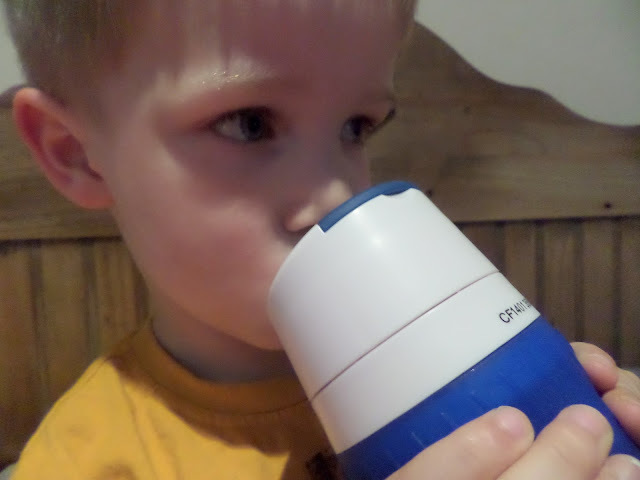 As we love our Chill Factor Slushy Maker we were excited about trying out Chill Factor’s new creation, the Chill Factor Drink Bottle. The Chill Factor Drink Bottle is no ordinary drinks bottle, thanks to its clever design and unique cooling pack the drink bottle is an easy way to chill your drink in seconds so that you have a refreshing and icy cool drink almost instantly. Not only does the drink bottle cool your drink after a few seconds, keeping drinks cold for up to 2 hours, but the bottle also boasts a hyper colour function to show how cool your drink is with the bottle casing changing colour. The Chill Factor Drink Bottle comes in 2 colour version, a blue version (which we were sent) and a pink version. The bottle boasts being able to hold an impressive 600ml of drink, it is BPA free and is suitable for children age 3+ years. 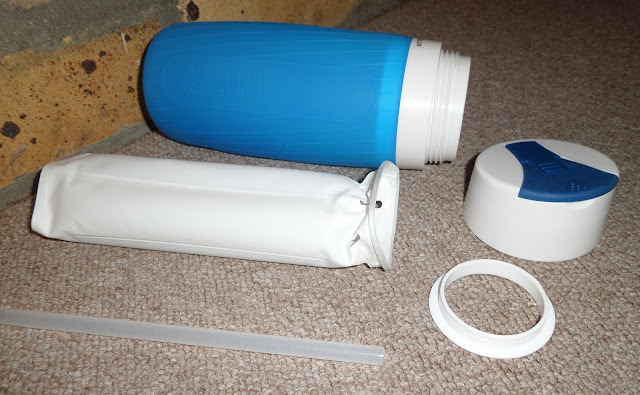 The bottle is very well made; with the lid, collars and washer being made from durable white plastic, and the outer casing being made from a soft and pliable yet extremely sturdy silicone which is a lovely bright blue colour. The cooling pack is constructed of what looks like strips of ice packs, with the innovative design fitting perfectly inside of the outer casing of the bottle. A novel feature of the bottle is that it has both a sippy spout and a straw spout, making it adaptable for children of different ages who prefer different spouts to drink out of. 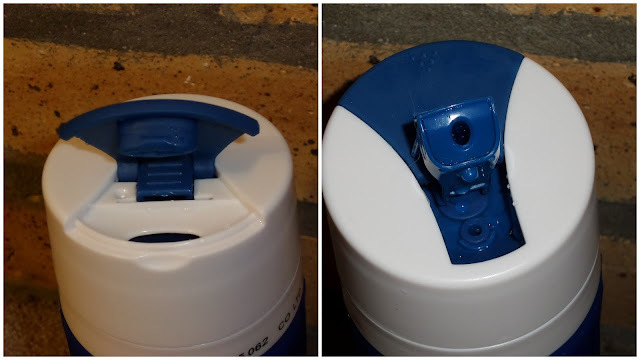 The bottle is easy to assemble and dissemble, making cleaning the bottle easy especially thanks to the handy cleaning instructions. Whilst it was of no concern to us as we don’t have a dishwasher, if you do please note that the soft silicone outer bottle casing and the cooling pack are hand washable only. Freeze – remove the cooling pack from the bottle and place the cooling pack in the freezer for 4-6 hours until frozen and hard (leave overnight if not freezing within 4-6 hours). For optimum performance it is recommended to freeze the cooling pack upright…..but as it is quite tall this might be a tad difficult if your freeze is not very big. Fill – once the cooling pack has frozen place it back in the drink bottle, reassembling the drink bottle without the lid. Then simply fill the bottle with chilled or room temperature water or juice (carbonated drinks don’t work with this bottle). Squeeze – after filling the bottle with your drink of choice, secure the lid on tightly and ensure that both spouts are closed. Then simply SQUEEZE the bottle for 15 seconds. As the bottle chills the drink you will notice the bottle changing colour to show how your drink is icy cold. Enjoy – simply drink and enjoy your refreshing, chilled drink using either the sip spout or straw spout. Take a look at the official video below to see the bottle in action (video can also be seen on the Chill Factor website). Bug has been enjoying icy cold drinks over the past few weeks thanks to this drink bottle, helping cool him down on his grand adventures outdoors. As Bug is so keen on drinking from this bottle I know it will get a lot of use this summer - and hopefully for a few years to come too. I am very impressed with the drink bottle, being especially fond of the fact that it is BPA free. I also like the fact that unlike adding ice cubes to the drink, using this innovative bottle with internal frozen cooling pack means the drink does not get diluted as the ice melts. I think the bottle is great for children and adults alike to use . The only thing I think of that would improve the product is if it came with an extra cooling pack or if extra cooling packs could be bought separately as 4-6 hours is a long time to wait for the cooling pack to freeze again to be re-used. Overall though we love the Chill Factor Drink Bottle and as it will be come in very handy to keep us hydrated and refreshed this summer, especially when we are enjoying adventures outdoors, we will be picking a couple more bottles so the whole family can benefit from the cool Chill Factor effect. The Chill Factor Drink Bottle can be purchased via Character Online as well as other top retailers (RRP £12.99). 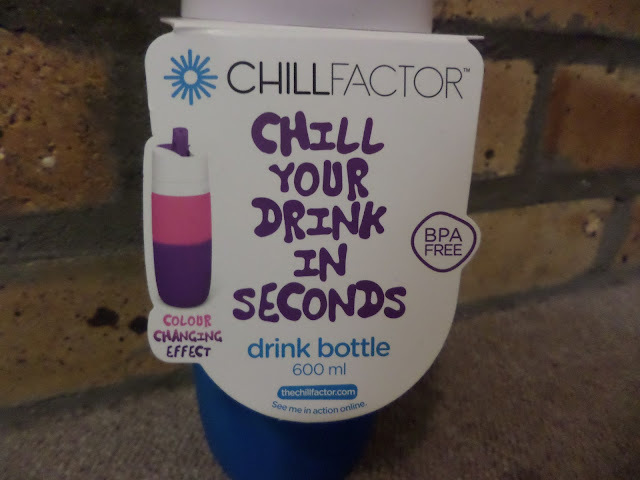 Check out the Chill Factor website for full details of their Drink Bottle as well as more clever and useful Chill Factor products.